A group of teachers and senior students�Mel Weitsman, Victoria Austin, Mary Mocine and Mary Watson�have just completed recording a series of interviews with Zenkei Blanche Hartman. 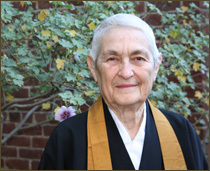 The interviews explored Zen Center�s robe-sewing tradition, Zenkei�s relationships with Shunryu Suzuki Roshi and Mitsu Suzuki Sensei (Okusan), Zenkei�s family and marriage, her role as abbess, and other topics. All the interviews will be gifted to Zen Center for its archive, and some of the interviews may be shared quite soon with other practice centers, particularly the interviews focused on sewing Buddha�s robe. Volunteer help is needed to type the transcripts. Help is offered to teach anyone how to turn their Mac or Windows computer into a wonderful transcription machine�the software is free and easy to use. The work can be done from home via the convenience of a link to the digital file stored online. If you would like to volunteer to type a transcript, please contact the organizer of the project, oral historian and former Zen Center resident and staffer Basya Petnick: call 415-252-0694 or email books1000@mac.com or visit www.booksandlives.com.